So you happen to own one of them 12-inch Pro tablets and you think you got yourself a big ol' tab? Meet the Toshiba TT301, a massive 1080p 24-inch screen slate that's quite literally bigger than bigger! 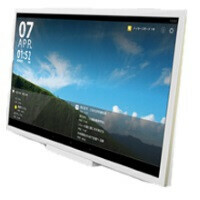 Heck, it's basically a TV, although Toshiba prefers to call it a "business tablet". The Rubenesque fondleslab is powered by a 1GHz dual-core processor, has 1 and a half gigabyte of RAM, 16GB of built-in storage, and most unsurprisingly, an infrared remote control. With HDMI and Miracast on board, plugging in your Windows 8 desktop to use the 4 pound (1.8kg) business tablet as a business PC monitor, or mirroring a smartphone screen pose no problems. There are two 2W integrated speakers as well, so you can get by without external audio. On the software side, the Toshiba TT301 offers Android 4.2.1 with a pretty custom launcher and multi-window functionality. The TT301 will launch in Japan first, but Toshiba hasn't revealed dates or pricing. nothing wrong with calling functions. if it has 4G connection, the call function is a given. why intentionally leave it out when the 4G radio is there? it can always come with an accessory mini phone/headset to answer calls. The headline made me think it was some sort of super tablet with super specs. Kind of disappointed. No matter how much time they did put into optimizing this tablet, this will lag like a bi@tch when you take into consideration that you only have a dual core cpu and 500mb of ram to power a 24" 1080 screen. Ram is 1.5 GB but still disappointing plus cpu should have been a faster atleast intel i5 if they mean it business. i will scream "Now i've seen everything" and bang my head against the wall, if I saw someone walking around using this in portrait mode to check their notifications. Lmao!!!!!!!!!! Your comment made me choke. Hi Readers Toshibha made a wrong comment. it's not a Tablet its 24'inch TV. In my office i use the same size monitor for my work. I can't imagine how do be transport in hand or ?????? itd be cool if th specs were like: RAM 4gb CPU te ppi 360+ 2k display 10 finger mutitouch display came with some super strong case that allowed it to stand by itself. why make such a big tablet with such meager specs?